UTech, Jamaica and Ministry of Industry, Commerce, Agriculture & Fisheries sign $11M Contract to Assist Residents in Sugar Belts to Establish Businesses — UTech, Ja. Signed Contract: Sharing a light moment following the signing of a contract agreement between the University of Technology, Jamaica and the Ministry of Industry, Commerce, Agriculture and Fisheries (MICAF), from left, are Mr Donovan Stanberry, Permanent Secretary in the Ministry, the Honourable Karl Samuda, CD,MP, Minister, MICAF, Her Excellency Malgorzata Wasilewska, Ambassador and Head of Delegation to the European Union in Jamaica and Prof. Stephen Vasciannie, CD, President, UTech, Jamaica. Witnessing the signing is Mrs. Keleen Young-Grandison (standing), Project Manager, Sugar Transformation Unit, MICAF. The contract between the two entities was signed at a special ceremony held at the Ministry’s offices in New Kingston on Wednesday, June 28, 2017. 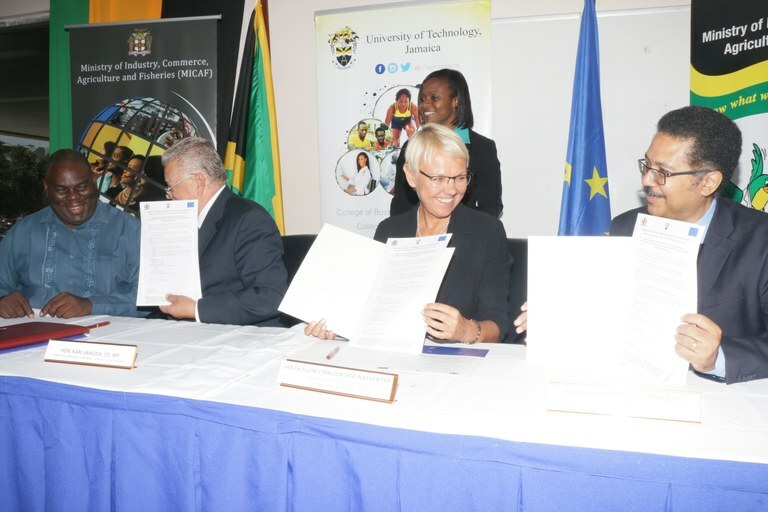 The University of Technology, Jamaica and the Ministry of Industry, Commerce, Agriculture and Fisheries (MICAF) on Wednesday, June 28, 2017 formally signed a contract agreement under which the University through its Joan Duncan School of Entrepreneurship Ethics and Leadership (JDSEEL) is participating in a partnership project to facilitate residents of Sugar Dependent Areas of Jamaica to establish at least 80 feasible business ventures. The ceremony for the official signing of the contract was held at the Ministry’s New Kingston Offices. The project is part of the final set of activities (year 2) of the Accompanying Measures for Sugar Protocol 2013 Financing Agreement signed between the European Commission and the Government of Jamaica and is being implemented through the Sugar Transformation Unit (STU) of the Ministry. €15,000 has been allocated by the European Commission for the successful implementation of these activities. Monitoring of the start-up of each business. Of the 193 persons who expressed an interest in accessing grant funding to establish businesses, preliminarily 126 applicants were selected as prospects and feasibility assessments were conducted. 98 business ventures were deemed to be feasible and business plans are being created as well as the registration of the selected businesses with the Companies Office of Jamaica. The business ventures that will be established range from livestock rearing (goats, sheep, chicken, cows and pigs) ‘apiculture’, retail (green grocery, farm supplies and household products), restaurant, entertainment, rental and promotions, to welding. Approximately $94m in grant funding will be provided to aid in the establishment of these enterprises/businesses. The President shared that the TIC business incubator since its establishment in 2002 has nurtured over 260 client businesses which have gone on to be very impactful on the economy. He thanked the members of the Project Team: Miss Dionne Palmer, TIC Incubator Manager and Project Lead, Mr. Prince Graham-Haynes, JDSEEL Lecturer and Co-Project Lead, Mr Michael Steele, Head of School, JDSEEL and Mr. Frederick Mills, Lecturer, JDSEEL. 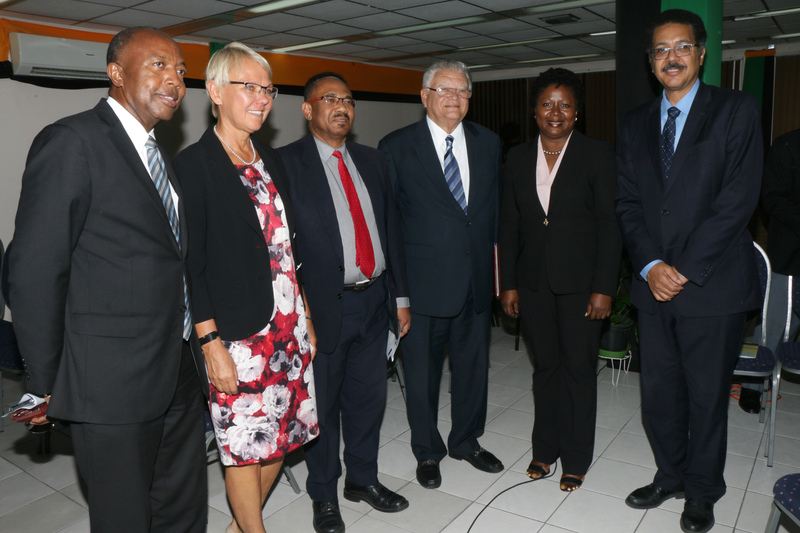 The Honourable Karl Samuda, CD, MP (4th left), Minister of Industry, Commerce, Agriculture and Fisheries (MICAF), Prof. Stephen Vasciannie (right), CD, President, UTech, Jamaica and Her Excellency Malgorzata Wasilewska (2nd left), Ambassador and Head of Delegation to the European Union in Jamaica pose with members of the Project Team from the University’s Joan Duncan School of Entrepreneurship Ethics and Leadership (JDSEEL). From left are Mr. Prince Graham-Haynes, Lecturer and Co-Project Lead, Mr Michael Steele, Head of School, JDSEEL, Miss Dionne Palmer, TIC Incubator Manager and Project Lead.